Captain Edward John Smith, RD, TM, RNR, MN. Edward John Smith, known to the Merchant Navy as "E.J." was born in 1850 at Hanley, in the Potteries of Conurbation of Staffordshire, not quite as far from the sea as is possible to get in England. Nonetheless, on leaving school at thirteen he went to Liverpool to serve an Apprenticeship under sail with Gibson and Company. In 1880 Smith joined the White Star Line as Fourth Officer on the RMS Old Celtic. By 1887 he was Captain of the RMS Republic, and served during the Boer War (1899-1902) captaining troop ships. This earned him the Reserve Decoration (RD) and the Transport Medal (TM), and the rank of Commander in the Royal Naval Reserve. This is why on ships he mastered the Blue Duster of the RNR was flown instead of the Red Duster flown by the British Merchant navy. By 1911 had commanded 17 White Star ships. 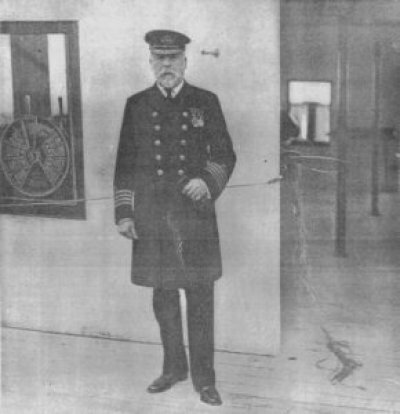 In 1904, Smith was promoted to Commadore of the White Star Line and given command of the (Second) RMS Oceanic. Between 1900 and 1911 he had a number of minor accidents. However on September 20th, 1911 Smith was in charge of RMS Olympic when she was rammed by the Warship, HMS Hawke, causing severe damage to both ships. Smith was cleared in the inquiry into the disaster as the Olympic was under the harbour Pilot's control. Some of the Officers of the RMS Olympic. From left to right standing; First Officer: Lieutenant William McMaster Murdoch, RNR, Chief Purser: Herbert Walter McElroy, Master-At-Arms: William Thomas Bailey, and Third Officer: Lieutenant-Commander Herbert John Pittman, MBE, RD, RNR. Left to right seated; Commadore of the White Star Line and Master of the RMS Olympic: Captain Edward John Smith, RD, TM, RNR,Surgeon: Lieutenant-Commander (ret) William Francis Norman O'Loughlin, RD, RNR. It was customary of the White Star Line to put their Commadore in charge of ships on their Maiden voyage and in 1912 Commadore Smith was made master of the RMS Titanic. The 62 year old Captain, was sailing the RMS Titanic to New York on his last trip before retiring. One of the last photo's ever taken of Captain Edward John Smith, RD, TM, RNR. It was taken on the Port Wing Bridge just forward of the Wheel House. An Engine Room Telegraph can be seen in the background. Aboard the Titanic, Captain Smith began his days with a thorough inspection of the ship. He did this in full dress uniform with medals. He took the Chief Engineer, Chief Purser, Assistant Purser, Surgeon, and Cheif Stewards with him on the inspection. After that, he assembled the officers to discuss the day's navigation and inspection results. In the evenings, he most frequently dined at a table for 6 in the first class dining room. In thick weather or in port, he ate on the bridge or in his own quarters. Respected by both crew and passengers, he was the White Star Line Patriarch - a part Smith played to the end. "I don't think I've ever seen such a flat calm..."
"It will make the bergs difficult to see, sir..." . He then went to his night cabin behind the Wheel house, and instructed Lightoller to call him if he needed anything. After the liner struck the iceberg, Smith knew within minutes that the ship was doomed and that people would die. He did all in his power to minimize panic and as the Captain, went down with his ship. There are many Stories of the last minutes having him with a small child in his arms, exhorting to his crew to "...be British...". or and this is most likely, standing on the bridge as the Titanic foundered. His body was never recovered. Smith was one of the best Captains of his time. He was lost in the sinking. He was to be Knighted after his return voyage, this did not happen. He left a widow, Eleanor Sarah (nee Pennington) who was later killed by a taxi-cab, and one daughter, Helen, twelve years old.